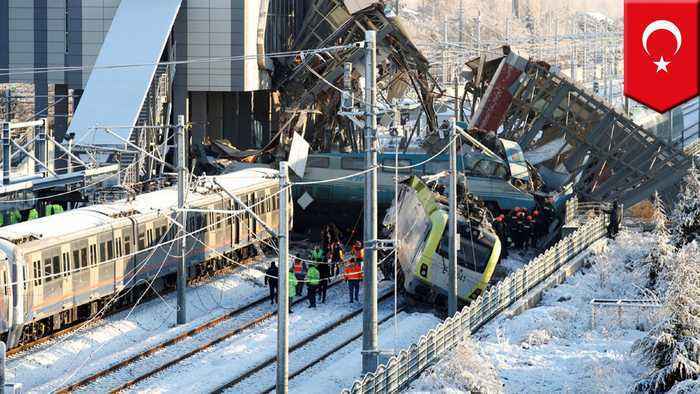 ANKARA, TURKEY — A high speed passenger train collided head-on with a maintenance locomotive Thursday morning in the Turkish capital of Ankara, killing at least nine people and injuring dozens others. The New York Times reported that according to Anadolu news agency, the train was carrying 206 passengers from Ankara toward Konya Province. According to Transportation Minister Mehmet Cahit Turhan, the accident occurred around 6:36 a.m.
As "the train leaving Ankara station crashed into the engine turning back from" doing maintenance work on the track. According to the BBC, the crash happened at Marsandiz train station about 5 miles or 8 kilometers from Anakara's main station. According to the New York Times, the accident pushed two carriages off the track, where they ran into the support legs of an elevated walkway, causing it to collapse onto the train. Health Minister Fahrettin Koca told broadcaster NTV that 84 people were injured, including two people in critical condition, according to the New York Times. Three people have been arrested in connection with the accident, and prosecutors have been assigned to look into the crash.